Managing the collection and review process is the single greatest challenge meeting professionals face when it comes to conference content. That’s what you told us in the 2016 State of the Conference Industry report. There are a lot of variables that can make abstract management a challenging experience. Keeping track of submissions and reviews from a large number of people is a tough task in and of itself. Add tight deadlines, last-minute changes and limited staff resources to the equation and you can see why so many event professionals are unhappy with their process. Having the right tools makes a big difference in managing your collection workflow, but there are also some best practices you can follow to keep your content collection on the right track. Omnipress has been helping customers collect their conference content online for 15 years. During that time, we’ve developed ideas, best practices and tips to make the process of sourcing and producing your conference content easier to manage. 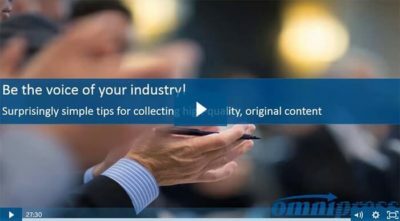 Our recent webinar “Surprisingly Simple Tips for Collecting High-quality, Original Conference Content” was devoted to sharing this knowledge. Stop dreading content collection! Watch the pre-recorded webinar video, “Surprisingly Simple Tips for Collecting High-quality, Original Conference Content,” to bring content collection best practices to your next conference.